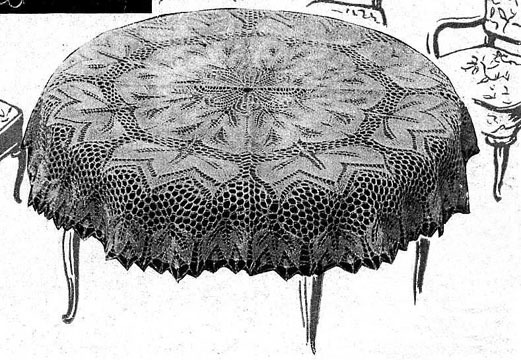 This knitted lace tablecloth pattern was designed by Herbert Niebling, was named "Lotte", is in chart form only with English text, and is 145 Rounds, measures 21" (52 cm)) when worked on U.S. Size 5-0 (1.00 mm) needles, with "fine yarn"; 44" (110 cm) on U.S. Size 1 (2.0 mm) needles, "medium weight" yarn.